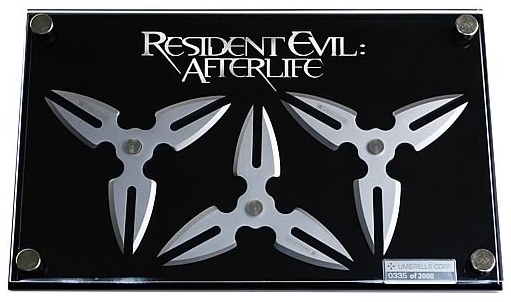 These are an officially licensed prop replica of Alice’s Throwing Stars from Resident Evil: Afterlife. Limited edition of 2000 pieces worldwide. Alice’s Throwing Stars are a a full sized and highly detailed prop replica based on the one’s used by Milla Jovovich in the film. Features three stars that bear the Umbrella Corp logo and comes complete with a display case and certificate of authenticity. Display case measures about 10-inches wide x 6-inches tall. This is Master Cutlery’s prop replica of Baby Doll’s Katana, the sword Emily Browning wielded in Zack Snyder’s fantasy film SUCKER PUNCH. 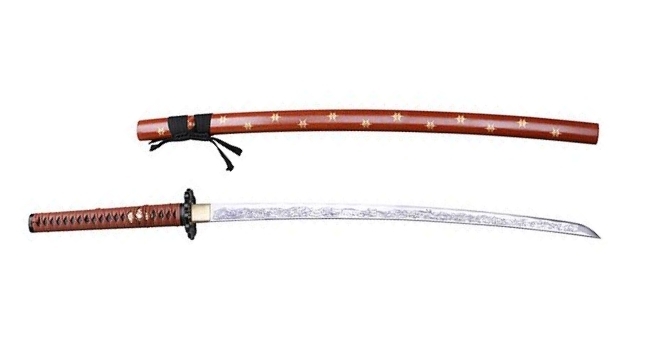 This movie collectible is a full size (43″ long) stainless steel bladed replica that comes engraved with the same symbols as the one seen in the movie. Features a rayskin wrapped handle, ornate guard and gold snowflakes on the scabbard. Limited edition of 2,000 pieces, includes a certificate of authenticity. Comes with collectible box packaging.